My friend, Tania, is undertaking a 3-month interstate secondment for work, starting next week. One farewell is usually appropriate, but she's having a series of farewell activities this week - madly ticking off things on her Canberra bucket list (which is making me wonder if she's going to be coming back at all!) To kick off the "farewell activities", as I'm now referring to this series of celebrations, we went to dinner at Italian and Sons in Braddon, as it had been years since Tania's last visit to this popular Canberra restaurant. The only available options for booking times on this Wednesday night seemed to be 6:30pm or 8:30pm. The latter seemed horrendously late for a "school night", so we opted for the earlier sitting. The restaurant was stylishly furnished, if a bit cramped, sitting very close to the neighbouring tables. This impacted on our ability to hear the Specials being recited to us and we could barely make out what was being said. (There are only so many times you can ask someone to repeat themselves). No matter, I'd already decided I was going to have a pasta dish and possibly an entree as well. I decided to order the whitebait fritters ($16) for my entree (note that the dish comes with 3 fritters, but the waitress divided up the fritters before I could take a photo of the complete dish). The size of the fish can vary significantly, which can influence how it is cooked. I've normally had whitebait battered individually and then fried. However, Italian and Sons took a different route. The fritter was crisp on the outside but the substance of the fritter was quite bland. The flavour came from the aioli-like sauce. I thought the dish could have done with a bit more of the sauce, especially as, by chance I got a bigger dollop of sauce than everyone else. Next, we had the 'insalata caprese'. The point of a menu is to communicate to the customer what food is on offer at the restaurant. If a menu item is solely in Italian, with no English translation (I'm talking about uncommon terms here), I'm left to wonder whether the owner thinks that a) only Italians (or those that can read Italian) will enjoy and order this dish, or b) if a customer can't read the menu item, then they don't deserve to eat it. Obviously, I disagree with either approach. If I don't understand it, I won't order it (particularly in a noisy restaurant where I can't be bothered to ask about every foreign term I don't understand as I probably won't be able to hear the explanation anyway). Why risk losing potential business by not communicating clearly on the menu all the food you have on offer?? Why alienate customers and make them feel inferior just because they can't understand everything on your menu? Tania described a salad that she really liked - mozzarella, tomatoes and basil leaves, but she couldn't see it on the menu. Luckily, I knew it as 'insalata caprese' and I had seen it on the menu. The flavours were good and the ingredients were fresh. Despite my issues with the menu, (grrrr) I genuinely liked this dish. The scallops came next and I was severely underwhelmed when I saw two of them on the plate. Two scallops for $15?! They were good, but I didn't think they were worth the $15 price tag. My spaghettini with spanner crab ($29) came out next. It was a good dish. The pasta was al dente, though maybe a tad too chewy. The flavours were bold and matched well with the 'pangrattato' (a breadcrumb topping). I really enjoyed the slight kick from the chilli. The service throughout the night had been a bit...awkward - the softly spoken waiter in the noisy restaurant was difficult to hear, the other waitresses who seemed overly concerned with topping our water glasses (which was great) but not much else (not so great). It was a bit tricky to make eye contact with the busy wait staff. Once we had gotten the wine list during the meal, they'd forgotten to come back to take another drink order. The shining dish of the night was without a doubt, the tiramisu ($13). 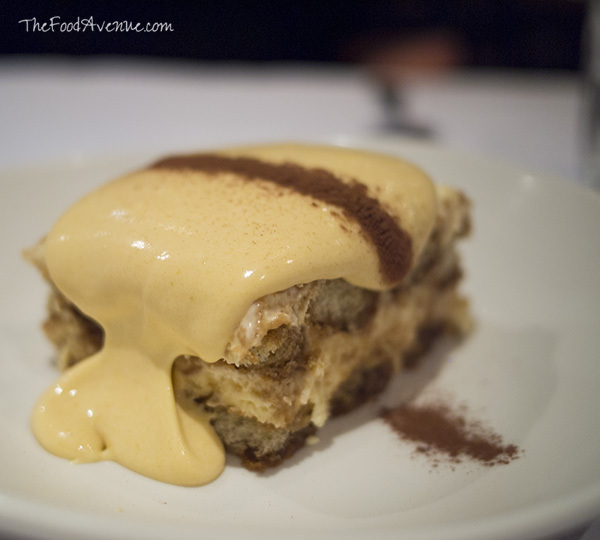 It was heavenly and possibly the best tiramisu I've ever tasted. It almost made us forget how average the service had been all night. But then the coffee that Tania ordered with dessert, never came. And we had to ask a couple of times for the bill. 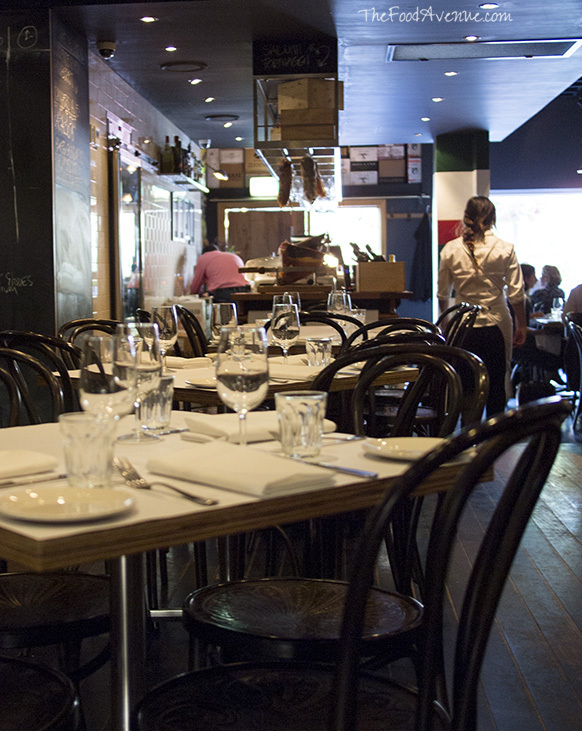 The restaurant is consistently busy pretty much every night of the week, so there seems to be quite a few fans of Italian and Sons. Perhaps we dined on an "off night"? Whatever the case, the whole experience left us remembering Italian and Sons more for the poor service and expensive prices (and for me, the annoying menu) rather than a place to go for good food. I am, however, looking forward to the other "farewell activities" in store this week! In particular, the scrumptious-sounding high tea at Adore Tea, which promises "a 'Tea-gustation' with French sparkling wine, beautiful savoury treats, luscious sandwiches, mouth-watering desserts, and a decadent, tea-infused sweet...all matched with inspirational teas!" Stay tuned for that review!